The Ministry of Education is introducing open book exams, part of its plans to revamp the country’s education system. Around 600,000 students from more than 2,000 public schools and 1,000 private schools are sitting for their final first-term exams which run from 13 January to 24 January. The open book system is being tried out for the first time on grade 10 students in Arabic, a second language, science, math and social studies. Ministry of Education Spokeswoman Amina Khairy said students will sit for open book exams twice, in January and at the end of March. The results of the two exams will not be included in the final grades. “These two exams will be considered training for students to get acquainted with the new system,” Khairy said. “Open exams are meant to teach students how to receive information and apply it in a thoughtful, deep manner,” Khairy said, adding that in an open book exam, the focus is not on memorising but applying information. Arabic teacher Mohamed Mahmoud, who teaches grades 10-12, believes open book tests are actually more difficult than traditional exams. “Instead of merely memorising facts, students are required to apply concepts and explain ideas. Open book exams need just as much studying as any other exam,” Mahmoud said. According to Mahmoud, before the exams, students must read all the material they have and make notes on the margins. They must know where important ideas and concepts are in their books so they do not waste time searching for them during the exam. The Ministry of Education has trained teachers of grades 10, 11 and 12 on the new system, Mahmoud said. “The one-week training enabled us to understand the new system to give the information to students correctly,” he said. 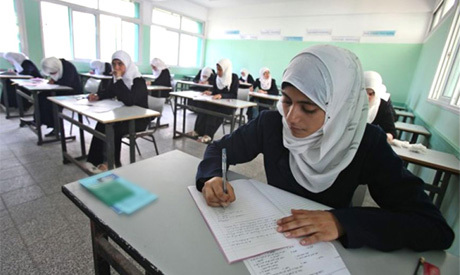 The ministry has received many complaints from students and parents that the Arabic exam questions were not included in the curriculum but Khairy denied that was the case. “Questions are derived from students’ curriculum but are posed in a different, indirect and unusual way. This is why grades of these exams will not be calculated as part of the final grades,” Khairy said. Other subjects such as biology were not criticised because the questions were direct and students could easily answer them from the book. Khairy said exams were being taken from the Bank of Knowledge, originally drawn up by a distinguished group of teachers, education experts and ministry officials. Grade 10 students could not agree on the new system. Nadine Hamdi, grade 10, believes it will end cheating. However, Omnia Harhash, another student, complained that the questions of poetry were off-curriculum, noting that the choices were very similar which caused confusion. “Allowing the book in the exam was useless,” complained Harhash. The new education system is part of the government’s 2030 strategy. The first phase of implementation will be compulsory for KG1, KG2 and first grade, as well as grade 10 in all public and private schools. The system will be applied gradually to other grades.